Kenn Fox has been a viable component of the Midwest music scene for over 40 years. He is known as a guitarist, composer producer and teacher. he is acclaimed for his explorations of many Musical styles, including fingerstyle, blues, Jazz, Slide Guitar, Celtic and World Fusion. 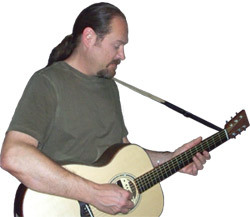 Kenn Currently performs and records as a solo artist, with the Midwest Guitar Trio, with the Celtic band Kellswater Bridge, and as a Historic Blues Duo with his wife Mare Edstrom-Fox. He is the owner of Anam Recording Studio in Watertown Wisconsin. Visit the Spiritone Records channel on YouTube for more videos!